1CSI Your Strategic Subsea Integrity and Inspection Partner! 1CSI provides technical advice, technology development, business development and project management, around the integrity and fitness-for-purpose of owner/operator subsea assets in the oil and gas and renewables sector. Subsea asset integrity is a growing challenge on the UK Continental Shelf and elsewhere, with each basin having its unique set of often complex demands. This applies to traditional oil and gas plant as well as the new generation of renewable energy structures. Matthew Kennedy looks at ways approach the challenge. In the UK North Sea alone there are some 45,000km of pipeline, umbilicals and cables and more than 5000 subsea wellheads (source: Oil and Gas Authority). Challenges maintaining this infrastructure during operational life take the form of varied failure and deterioration mechanisms. Fortunately, there is a multiplicity of inspection technologies and tools, extant, evolving and emerging, to help detect, measure and monitor anomalies. Many of those tools originated in the medical, nuclear and military sectors and have been successfully adapted to operate in the testing subsea environment. The range of problems affecting subsea asset owners and operators, to stay on the right side of the regulator, is wide but fundamentally includes in-service material degradation, due to years of operation and harsh environmental conditions leading to fatigue, and different corrosion types. Designers of subsea systems, such as pipelines, have engineered assets so that they meet their expected design life. This has been achieved typically by fabricating heavy wall pipes to accommodate internal operational wear and tear, together with coating systems to protect from external damage. Concrete weight coating and mats offer further protection and asset stabilization. Physical access to plant, for inspection, should be a prime consideration for operators. Where internal access can be gained, free swimming pigging operations can be launched to perform cleaning and low to medium-resolution screening. Similarly, tethered tools can be deployed into rigid riser systems to facilitate high-resolution examination. If internal access is not possible, external access might be achieved, via de-burial and weight coat and general fusion bonded epoxy (FBE) type coating removal, following which a range of techniques can then be considered for deployment. These include established techniques, such as eddy current, alternating current field measurement (ACFM) for detection of near and surface breaking component flaws, as well as electromagnetic transducer (EMAT) and long-range guided ultrasonics, for general pipe wall screening. A new generation of inspection methods has also emerged, including some which, until recently, were for topside use only, but have been adapted for underwater deployment. Underwater digital radiography has created the opportunity to see, without removal, through heavy coatings, including concrete, to assess the condition of steel pipelines, saving considerable preparation cost. Computerized tomography technologies allow operators to measure build-up of materials, including wax and hydrate, that may be affecting product flow. Ultrasonic systems, incorporating phased array, provide high resolution images that can directly underpin finite element analyses and the remaining life of rigid and flexible risers and pipelines. Acoustic resonance tools are also available to provide material examination through some coatings. Sonar, traditionally used for survey work, is also becoming more sophisticated and going beyond simply locating and positioning seabed assets, with the ability to provide actual condition assessment. In addition, the remote deployment of subsea inspection tooling using remote operated vehicles and autonomous underwater vehicles is assisting both mature and new technology developments. Evolving capability in this area can dramatically decreases the cost of collecting valuable plant condition data and opens up the opportunity for asset monitoring in subsea factory scenarios, where inspection, repair and maintenance (IMR) tools can be parked on the seabed and activated when required (OE: October 2016 & September 2017). With such a suite of options for inspection, the challenge becomes deciding what tool or methodology to apply. The specific nature of a given application (no two are ever quite the same) will quickly help generate a short-list of applicable techniques. Final owner/operator selection is invariably based on; criticality of the test requirement, awareness and availability of the most appropriate technique and the economic case for proceeding. For example, using what appears to be a compliant and economic solution to gather remaining thickness measurements on a pipeline by collecting single point ultrasonic measurements may tick the action box but may actually be a false economy. In practice a spread of high-resolution ultrasonic wall thickness maps are often necessary to perform meaningful assessment. This type of application has historically and justifiably been perceived as a costly option. However, with the advent of smaller, more efficient inspection tooling delivered by remote deployment systems the cost barrier for collecting this level of data has reduced significantly. Pitfalls, such as using inappropriate techniques, generate inadequate data, which in turn raise more integrity questions than answers. It also diverts and reduces budget that could have been applied in gaining real insight into the asset condition. For subsea inspection applications, the medium- to long-term objective is, as with topside plant, to have installed or local (seabed) based monitoring systems flagging up anomalies as they occur, relaying changing state information to shore in real-time. In the short- to medium-term it is a case of a regulatory compliance through discriminatory selection of all available technologies and delivery systems, in order to get them to where they are needed as cost effectively as possible. Matthew Kennedy is the CEO and co-founder of 1CSI, a newly established Aberdeen-based subsea integrity consultancy. Before that, he was subsea integrity manager at Oceaneering and prior to that held senior roles at AGR Field Operations. He studied at Durham University. Industry body Subsea UK has announced the finalists who are in the running to triumph at its 2018 business awards. Some of the country’s most innovative and successful subsea businesses have made it on to the shortlist for the annual awards which seek to recognise companies and individuals who are leading the way in Britain’s £7.5billion subsea sector. The awards dinner, sponsored by Baker Hughes GE and Helix Energy Solutions, will take place on Thursday 8th February 2018 at the Aberdeen Exhibition and Conference Centre, during Subsea Expo – Europe’s largest subsea focused exhibition and conference. Among the finalists, JDR Cable Systems, Tekmar Energy and Caley Ocean Systems are in the running to win the coveted Subsea Company of the Year award, sponsored by SMD. In the Global Exports award category, STATS Group, Tekmar Energy and Maritime Developments have been shortlisted; while the Innovation for Safety award will see SECC Oil and Gas, Maritime Developments and The Underwater Centre compete to take home the coveted accolade. The Small Company of the Year award will be contested by AgileTek, Namaka Subsea and DiveSource, while Rovco, 1CSI Limited and Triton Marine and Engineering Consultants have been shortlisted for the New Enterprise Award, sponsored by Wood. The shortlist for the Innovation and Technology award, sponsored by Simmons & Co International, comprises Hydratight, Swagelining and Maritime Developments. Arnold Grundy of Oceaneering, Robert Marshall of Shell UK and Jingyi Wan of JDR Cable Systems will contest the Young Emerging Talent award. The individual who has made the most outstanding contribution to the subsea sector will be announced on the night. Neil Gordon, chief executive of Subsea UK, said: "No matter what challenges we are up against as an industry, it’s vital that we continue to recognise and reward those who are working hard to exploit opportunities, innovate and export, while adapting to a new environment. Tickets for the dinner are available at: https://www.subseaexpo.com/subsea-uk-awards/dinner/. Starting up a new business in the current VUCA, (Volatile, Uncertain, Ambiguous and Complex) oil and gas industry may, at first glance, appear an act of some madness – but bear with me. Redundancy galvanizes people in different ways. In my case, it provided a trigger to put business ideas in place which hadn’t been possible within the confines of a multinational organisation. Not least because its corporate and decision making centre was on the other side of the world. During that leaving process a fellow departing colleague, and my business co-founder to be, made a compelling point in flagging up that subsea assets and degradation mechanisms are no respecters of downturns and redundancy. They will, of course, continue to deteriorate. In fact, more than 60% of the world’s oil and gas transmission pipelines are over 40 years old and, for the most part, in urgent need of rehabilitation in order to re-establish original operating capacity. So, the initial urge to use my new freedom to complete outstanding Munros and undertake an extended tour of Scotland’s finest golf courses was parked and the serious business of establishing a new, agile and dynamic subsea integrity business began. I was born a Piscean, which may help explain why I took to commercial diving and have been involved in underwater welding and engineering from the earliest stages of my working life. I always had a predisposition and passion for subsea activity, which I could fully indulge when I arrived in Aberdeen in 1991. I worked with a company pioneering and managing the use of underwater ultrasonics to collect high quality data used in assessing the fitness-for-purpose condition of subsea pipelines and structures. As the years passed ROVs increasingly replaced divers so in 2007 I invented the first ROV deployable, high resolution ultrasonic scanner, imaginatively titled ‘Neptune’. There are still a number of these tools in deep water service globally and in 2015 one was used to collect images from flexible risers at a world first water depth of 1800m in the Gulf of Mexico. Being a veteran of the subsea integrity industry, I have been fortunate to have participated in the assessment of a wide range of underwater assets from risers, rigid and flexible, through manifolds, concrete coated pipelines, platform structures to offshore wave turbine structures and wind turbine monopiles. This varied portfolio has meant keeping abreast of existing and exciting new developments in subsea inspection technologies and utilising them to provide the safest, most cost-effective inspection solutions to underpin the respective owner/operators HSE fitness for service assessments. The simple reason for our new business is based directly on the ‘Golden Circle’s’ WHW value proposition. In this case the W, or ‘why’- is for us to support, time-stretched subsea asset operators, working with limited resources and their respective integrity cycles. ‘How’ we achieve this is through in-house know-how, together with collaboration and alliances with existing and emerging technology providers as well as SMEs looking to re-engage with the new industry regimes. ‘What’ we provide, in the first instance, is impartial solution advice on specific integrity issues and challenges and, if called for, follow up with a seamless, single point of contact integrity delivery. Both in preparation of our launch, and thereafter, we have received unprecedented encouragement and support from a broad range of industry bodies, including OGTC, SPE, OGIC, Subsea UK and the Institute of Directors. It demonstrates the level of backing available, and seeking it is something we would encourage new starts to pursue. While aligning with the low oil price remains the key challenge for oil producers and the supply chain alike, we are already seeing clear evidence that there is interest in and room to challenge the status quo with fresh ideas and approaches to maintaining the integrity of subsea assets. 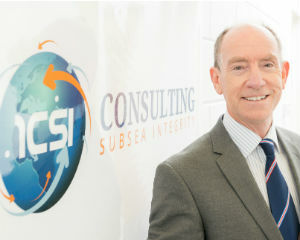 Matthew Kennedy is the CEO and co-founder of 1CSI Ltd, a newly established Aberdeen-based subsea integrity consultancy.